These clouds are weird. Usually, clouds look like fluffy puffs or big, mean anvils. But these clouds... these clouds look like stripes. These clouds are weird. 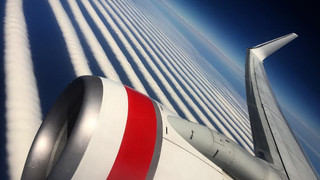 Virgin Australia shared a picture of these weird clouds yesterday on their Facebook page after Instagrammer Ilya Katsman noticed that the clouds were weird. “These clouds are weird,” he probably thought. Here is another picture of these weird clouds. Basically, Kubesh thought these clouds were weird.